What is that bird that Angie saw on the ground along the path a couple of times that looked like a roadrunner? Was it a grouse, or something else? What was the large-ish blue bird she saw as we left Tulln? We both agree that the yellow bird we both saw was probably an oriole. Is the population of Vienna larger than that of Brussels? Yes it is. 1.7 million compared to about 1.1 million. 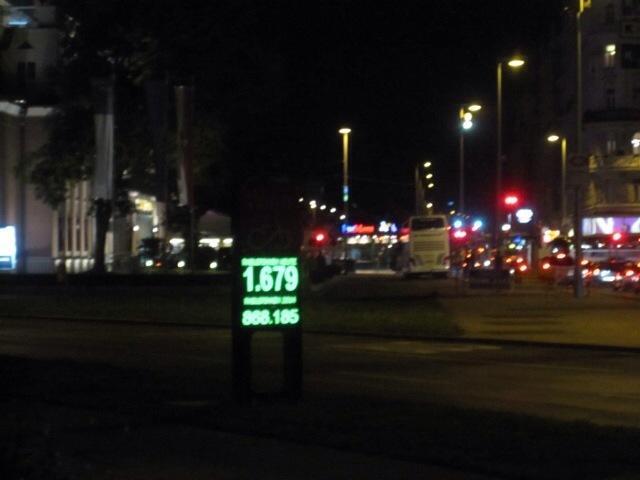 How crazy is it riding on the supposedly dedicated bike lanes in Vienna? Pretty crazy. 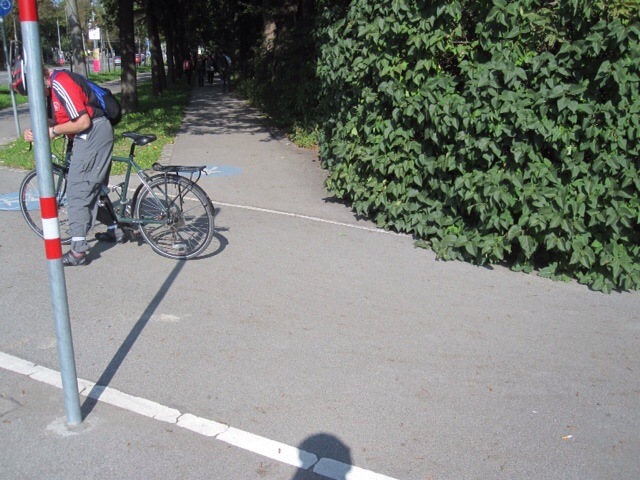 As we were leaving Schonbrunn today, two women on foot pulling wheeled suitcases came around a blind corner, forcing me to crash into Angie as she braked, since the bike path went around the footpath, which was hidden behind a shrub. This is said shrub and me fixing my brake levers after Angie and I had both picked ourselves up, dusted ourselves off, and made sure our bikes still worked. We each suffered a bit of bruising, but not too awful. And the big question. Why were all the religious folks going into the kosher restaurant on Judengasse before it was dark last night? They were clearly mainly Orthodox Jews. And is it just a coincidence that the one kosher restaurant in Vienna is on Judengasse? Once you go as far east in Austria as Tulln, you see a lot fewer carrion crows and a lot more hooded crows. There are still swans, and on Friday we even saw some flying. There are lots of swans. Everywhere we’ve been we’ve seen swans. And red kites. Not so many pigeons in Bruges since the peregrines kill them. 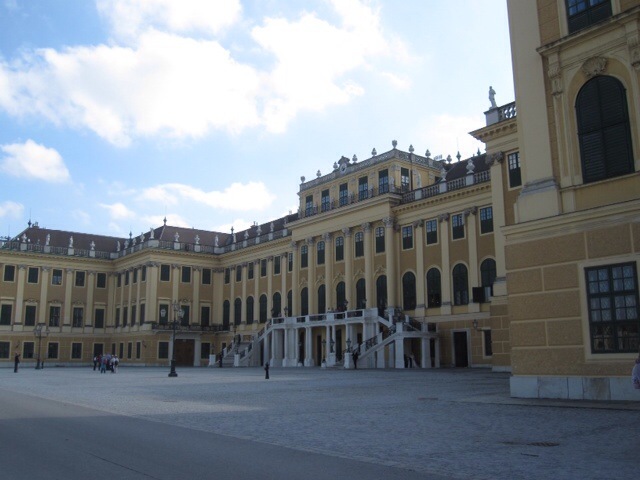 Vienna has some of the grandest buildings I’ve ever seen, and we haven’t even started really sightseeing yet. 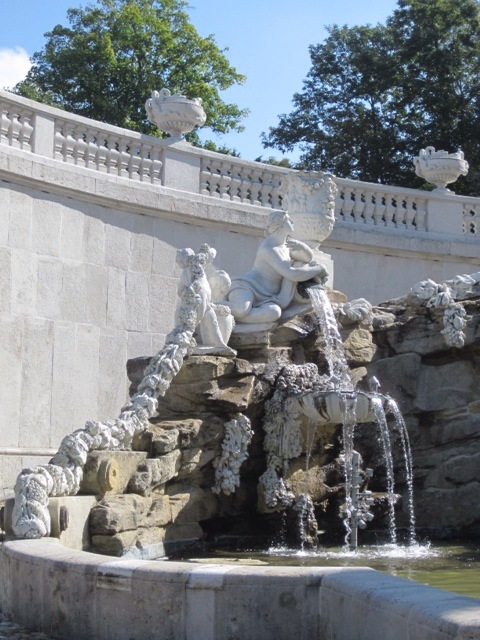 Schonbrunn, the summer palace, is massive, but at least most of the gardens were designed to be open to the public. 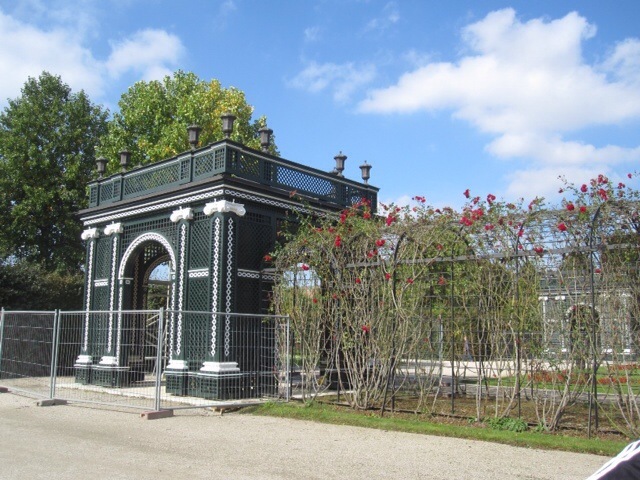 This is one of the top tourist attractions in Vienna and it was pretty busy today, on such a lovely day. 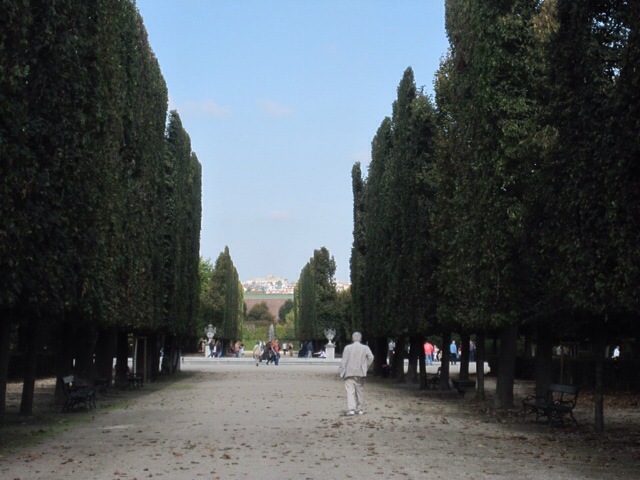 I asked Angie to take a picture of this avenue of trees because they had been, I don’t know what the word is, manicured, in such an interesting way. Corn is being grown in every country we’ve been to, but in Austria’s wine region, there is no corn growing, though there are plenty of other things, some of which we couldn’t identify. I guess there are still a couple of places where something is more lucrative than corn. We did see almonds, walnuts, apricots, apples and pears. Almond growing in California is contributing to the water crisis there so I do wonder what the impact is here. Our GPS is set to miles but it’s been really useful having a bike computer set to kilometers. It’s useful to see where you are since all the routes signs are in Km. So far, you can nearly always find somewhere to watch football. Last night we found an Irish pub inside the ringstrasse (downtown, sort of) that was showing both hurling and the Spurs v Arsenal game. And good food. It’s called Flanagans. Sometimes familiar food hits the spot. We’ve eaten a lot of Austrian food this week. It’s been good, but last night we needed comfort food I think. ‘Manicuring’ hedges is called Topiary, Sis. Chasidim going to Kosher restaurant – maybe some New Year-related activity? Is it still topiary if it’s trees? These were big trees all cut back so there was a line. And the chasids went in before it was dark. I hope your bruises are better today!